Irvine, CA, November 10, 2015 – Bluefin, the leading North American distributor of toys, collectibles, and hobby merchandise from Japan, Hong Kong and more, inspires collectors and pop culture fans to get ready for the 2015 holiday season as it details a diverse array of notable products and recent releases that can highlight shopping and gift/wish lists this year. Products were selected across all price ranges to appeal to a wide range of collectors and fans. Highlighted items include the Iron Man “Shot Gun” and “Igor” 1/12 scale Super Alloy figures from Comicave Studios which are available now, the Meisho Movie Realization “Ronin” Boba Fett, which debuts in December from Tamashii Nations, and an all-new Mega Man X figure from TruForce Collectibles, also available now. These figures may be purchased and/or pre-ordered through various official Bluefin online and retail partners. The company also highlights several exclusive Studio Ghibli products that includes music boxes, picture frames, calendars and other décor items inspired by popular anime films such as Kiki’s Delivery Service and My Neighbor Totoro. 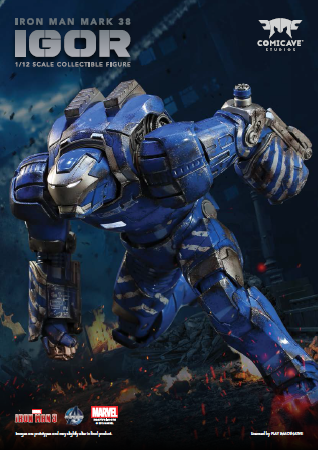 This holiday season, Bluefin also highlights a trio of prestige level, premium life-size Avengers: Age of Ultron Iron Man and Hulk statues from Beast Kingdom. These massive, screen accurate, museum quality renditions will truly take any fan’s collection to an entirely new level! 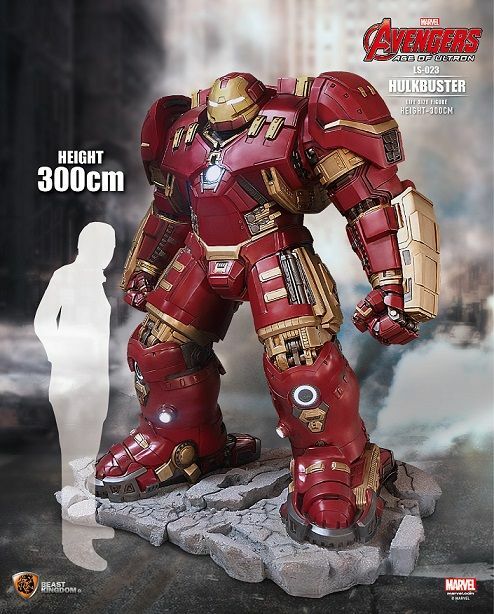 Beast Kingdom Toys is proud to present the LS-023 Avengers: Age of Ultron Iron Man Mark XLIV Hulkbuster Life-Size Statue. The statue features fiberglass construction and automotive paint to perfectly represent the Iron Man armor. Every intricate part seen in the movie is captured with expert sculpting and is individually hand-painted, showing off the highly detailed mechanical construction. The statue has LED lights installed in the eyes, arc reactor, palms, vernier thrusters, and knees (18 LED light-up points) which makes the Hulkbuster look even more majestic. Every Hulkbuster life-size statue features a realistic movie scenery base that shows its unstoppable strength. Beast Kingdom Toys is proud to present the LS-021 Avengers: Age of Ultron Iron Man Mark XLIII Life-Size statue. The statue features fiberglass construction and automotive paint to perfectly represent Iron Man's armor. Every intricate part seen in the movie is captured with expert sculpting and is individually hand-painted, showing off the highly detailed mechanical construction. The statue has LED lights installed in the eyes, arc reactor, and palms to make Mark XLIII look even more majestic. 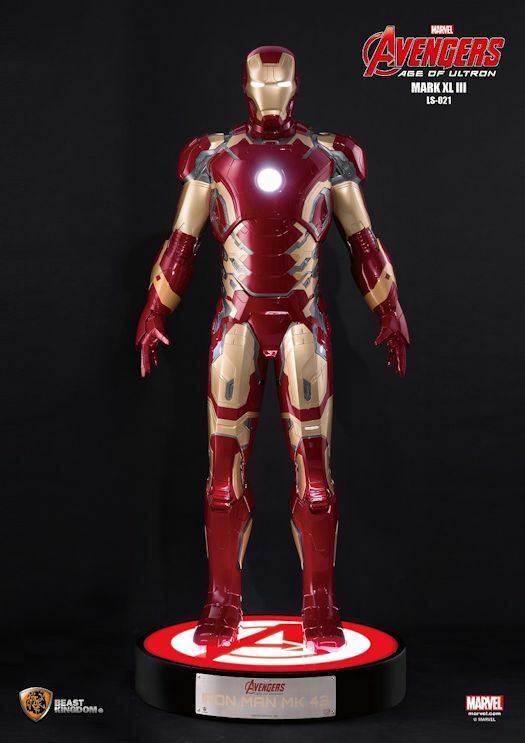 Every Iron Man Mark XLIII life-size statue features a light-up base with the Avengers: Age of Ultron design, reinforcing Iron Man’s membership in Avengers. Beast Kingdom is proud to present the LS-025 Avengers: Age of Ultron Hulk 1:1 statue, made with fiberglass and expertly colored with matte paint. The statue reproduces Hulk’s classic green skin and shows his facial and muscle details: showcasing Hulk’s tense, angry expression! 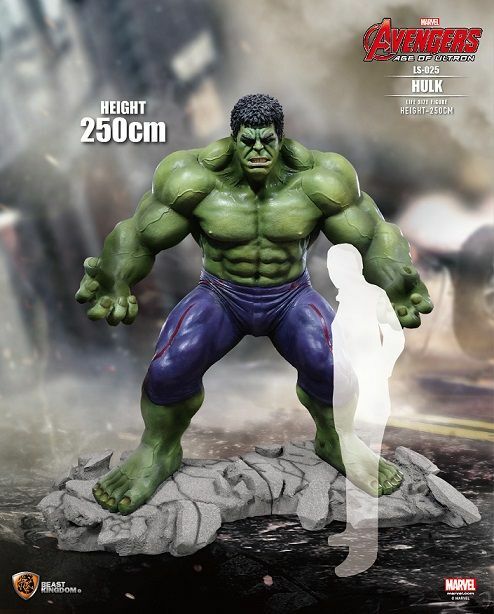 Every Hulk life-size statue features a realistic movie scenery base that shows the furious strength of Hulk. *Please note this product is very heavy (Over 700lbs) and requires intensive assembly, i.e. a lift! The following new figures from Comicave Studios and Tamashii Nations are available through various official Bluefin online and retail partners. Height: Approx. 8 inches; MSRP: $140.00; Available Now! The Comicave Super Alloy 1/12 Scale Shotgun from Iron Man 3 is a fully articulated, 6 inch tall figurine with interchangeable accessories, and LED light features in the eyes and chest. Straight out of the blockbuster action film, Iron Man 3, the Mark 40 variant, also known by its moniker, "Shotgun,” is a hyper velocity traveling suit and was one of several new Iron Man armored suits created by Tony Stark for the Iron Legion. The suit received its nickname, "Shotgun," for the explosive sonic boom it creates when breaking the sound barrier in flight. A Hyper Velocity Traveling Suit, the Mark XL (40) is currently the fastest suit of the Iron Legion, and can reach speeds in excess of Mach 5. Height: Approx. 6 3/4 inches; MSRP: $89.99; Available December 2015! Everyone's favorite bounty hunter goes medieval! Boba Fett joins the Meisho Movie realization series in a spectacular feudal Japan aesthetic, appropriately portrayed as a lord-less “Ronin” Samurai via the sculpting talent of artists Takeyuki Takeya and Junichi Taniguchi. In addition to his EE-3 rifle portrayed as an flint-lock style blaster, this deluxe figure set features an extensive array of accessories that includes a characteristic backpack missile that can be removed/attached, and a moveable helmet mounted scope. In addition to a short ninja-style katana and sheath, numerous ninja-style blade accessories that are also included can be subtly attached to shin and forearm area mounting points. Height: Approx. 6 inches; MSRP: $79.99; Available Now! TruForce Collectibles is proud to bring Mega Man fans around the world, an all-new action figure of X unlike any released previously. Developed by one of Capcom's talented artists, this unique version of X features die-cast armor, LED functionality in the X Buster with red LED, swappable face and hand parts, customizable effects parts and over 30 points of articulation to help you recreate all of X's iconic poses! Available now at select Barnes & Noble store locations and also from barnesandnoble.com. Each Studio Ghibli item is a work of art, masterfully crafted to reflect the simplicity and depth of the Studio’s most beloved and unforgettable characters while giving fans a peak into the enchanting worlds they inhabit. An adorable Jiji mirror from Miyazaki's "Kiki Delivery Service". The beautiful stained glass elegantly accentuates the antique-style window framed mirror as Jiji innocently looks peers back at you. Totoro's Band Music Box from "My Neighbor Totoro"
Listen to the sweet sound of Totoro's band through this enchanting music box. Jiji's Gift Music Box from "Kiki's Delivery Service"
Enjoy the pleasant melody from Jiji's antique-style music box. Totoro's Flower Trumpet Accessory Box from "My Neighbor Totoro"
Use this little log to store your accessories in the compartment below. Totoro perches on top of the case while holding an adorable flower trumpet. Totoro Perpetual Calendar from "My Neighbor Totoro"
Enjoy your new favorite desk mate Totoro as he helpfully provides the day and date… forever. The Studio Ghibli products listed above are available at Barnes & Noble store locations at: Caldor Plaza in West Woodland Park, NJ; Enfield Commons in Enfield, CT; The Centre in Copperfield in Houston, TX; South Hills Village in Pittsburgh, PA; the Milford location store in Milford, CT; University Park Mall in Mishawaka, IN; The Co. Blvd II location in Glendale, CO; the Sarasota II store in Sarasota, FL; the Northwoods Shopping Center in San Antonio, TX; and the North Village Shopping Center in North Brunswick, NJ. Based in Irvine, CA, Bluefin built its reputation as a leading distributor of Japanese toys, collectibles, novelty and hobby products. In recent years, Bluefin has grown to include a range of high quality collectible lines from the United States, Hong Kong, Taiwan and Singapore and established itself as the official North American consumer products and retail development partner for Studio Ghibli. Selling to thousands of specialty, chain and independent stores, Bluefin is an official North American distributor for Bandai Hobby, Kotobukiya and Capcom, is the sole provider of Bandai Tamashii Nations products, and is also the exclusive and official distributor for Beast Kingdom, Comicave, Mr. Hobby, SEN-TI-NEL, Storm Collectibles and X-Plus. Bluefin also represents TruForce Collectibles products worldwide. Additional information is available at: www.bluefincorp.com.